We’re winding down the school year here in New York. Even though summer vacation is looming, I like to keep both my boys in the learning mode year round. During the summer we do a lot of reading together (especially when we’re stuck inside during the hottest days! ), and I’m glad to have some new fun books on hand from National Geographic Kids Books that are both fun and educational. Look & Learn: Bears ($6.99) – this is a great book for my 4-year-old little guy as it’s easy to follow along with, and it has some great pictures to go along with all the bear facts. The size is great for little hands too. 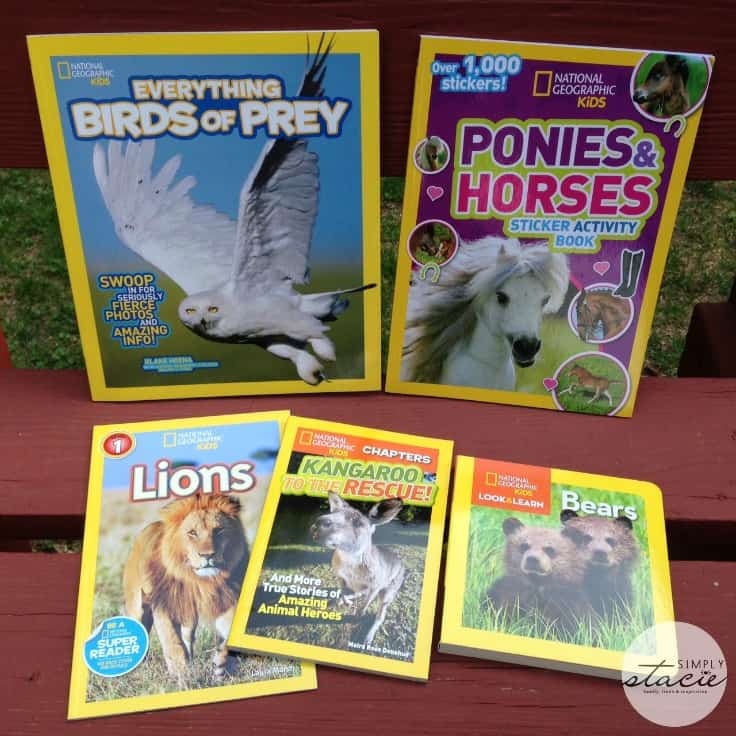 National Geographic Readers: Lions ($3.99) – this is a Level 1 reader book, and my kindergartener can get by with a little help from me reading it along with him. This book has a lot of cool facts about Lions with pictures to go along. Chapters: Kangaroo To The Rescue! ($5.99) – this chapter book includes many true stories of different animal heroes – from pigs to dogs. 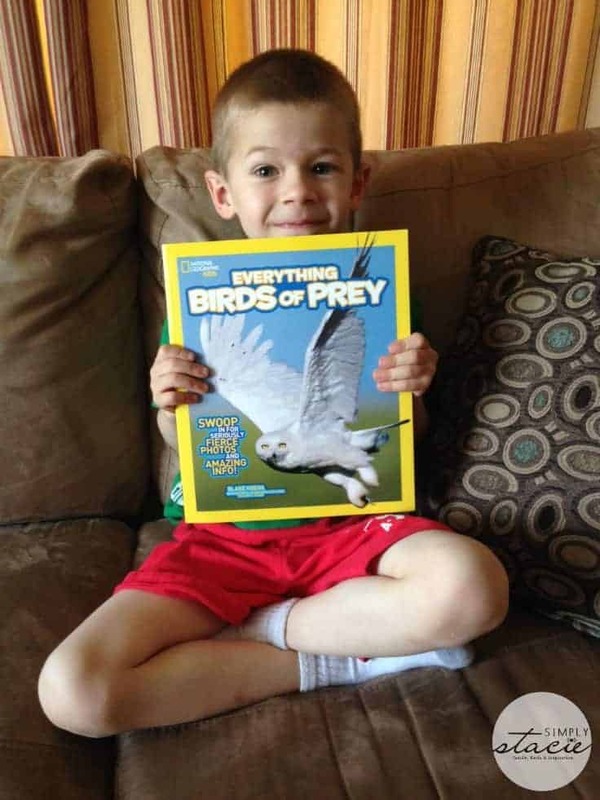 Everything Birds of Prey ($12.99) – my big guy was especially excited about this book since he just had an event at school about birds of prey. The pictures in this book are incredible, and there are a lot of neat facts about these amazing creatures. Ponies & Horses Sticker Activity Book ($6.99) – this book we’ve passed along to my niece who loves ponies and horses. This book is packed with stickers and activities such as mazes and spelling games. I love the quality of these books as much as I love the fact that they make learning fun. With great pictures that you’d expect from National Geographic, these books really give kids a close up look at the world that’s out there and makes learning interesting and fun. I have to say these books have taught me some new things too! You’re never too old to learn! 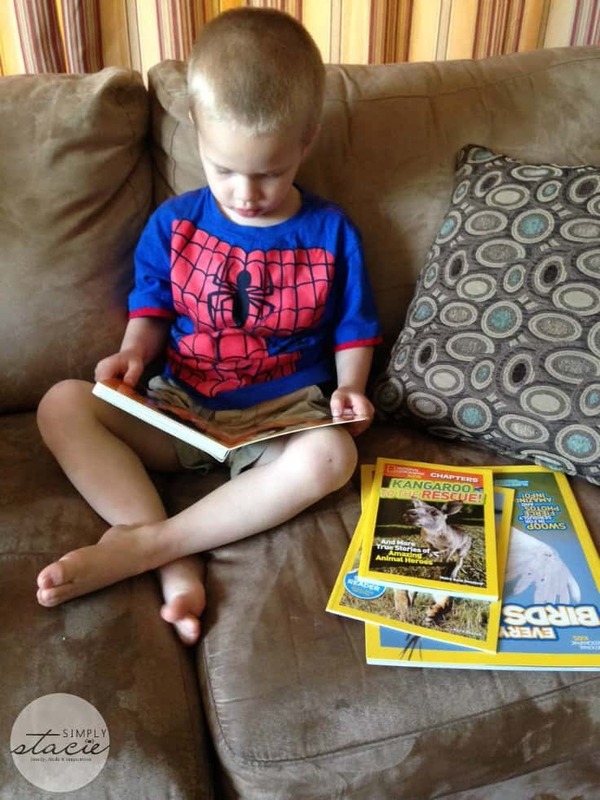 National Geographic Kids has also developed an amazing Super Reader site to complement their Readers series. It has prizes to reward reading effort, printable posters to help track progress, activities, quizzes, games and a whole lot more. To see all the neat things National Geographic Kids has to offer, check out their site. You can also connect with them on Facebook and Twitter. National Geographic Our World: A Child’s First Picture Atlas. I like baby animals pop! Another book I would like is the Treasury of Egyptian Mythology. Another book of theirs I’d love to have for my grandson is, the Rain Forest Colors. So cool with all the brightly colored animals and insects! Why’d They Wear That? looks interesting! The Jane Goodall book, we love monkeys! ‘Bad Days in History’ looks like schadenfreude-y fun. I heart the 2016 Almanac. My daughter would like the Puppy Love book. I love the Egytian mythology book. I like the Baby Animals book! I like the Weird and True Food book. Wow, so hard to pick one! I remember that I had a subscription to this in the lat 90’s, early 2000’s! If I had to pick one, it’d be: “National Geographic Readers: Penguins!”, since my daughter likes penguins so much :-). My daughter who is nine would love to read Treasury of Greak Mythology. She really loves learning about the gods and goddesses. I also like Why’d They Wear That? I would be hard pressed to make a choice as my grandson is totally wrapped up in bats and dinosaurs so it would be between The Ultimate Dinopedia and National Geographic Readers Bats but if pushed to chose I would go with the Bat book only because that was the topic of conversation last night. I think the Weird but True Food one sounds like a good one that my boys would also like! what a great idea, I would love to share with my grandchildren. I’d pick a subject book I loved as a child and still do : Greek and Egyptian Mythology. How fun would it be to win. The National Geographic Kids Ponies and Horses Sticker Activity Book looks very interesting!